The mega debris flow occurred on August 13th 2010 in Qingping town, China (hereafter called ‘8.13’ Debris Flow) have done great damage to the local habitants as well as to the re-construction projects in the quake-hit areas, and the channel-fill deposit problem caused by the debris flow was the most destructive. Moreover, it is of high possibility that an even severe deposit problem would reappear and result in worse consequences. In order to maximize risk reduction of this problem, relevant departments of the government established a series of emergency river restoration schemes, for which the numerical analysis is an important procedure to evaluate and determine the optimized one. 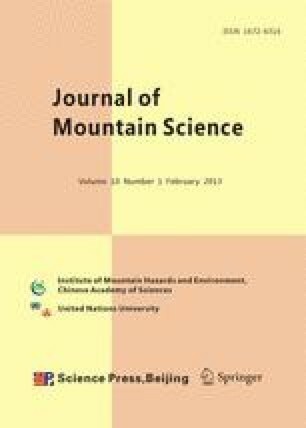 This study presents a numerical analysis by applying a two-dimensional debris flow model combined with a relevant water-sediment model to simulate the deposit during the progress of the debris flow, and to calculate and analyze the river flow field under both the present condition and different restoration conditions. The results show that the debris flow model, which takes the confluence of the Wenjia Gully to the main river into account, could simulate the deposit process quite well. In the reproduced debris flow from the simulation of the ‘8.13’ Debris Flow, the original river flow path has switched to a relatively lower place just along the right bank with a high speed of near 7 m·s−1 after being blocked by the deposit, which is highly hazardous. To prevent this hazard, a recommended scheme is derived through inter-comparison of different restoration conditions. It shows that the recommended scheme is able to reduce the water level and as well to regulate the flow path. Based on the given conditions of the mainstream and the tributary confluence for the simulated ‘8.13’ Debris Flow, when encountering a debris flow with deposit volume less than 0.5 million m3, the river channel can endure a 20-year return flood; however, when the deposit volume increases to 2 million m3, the flood capacity of the river will be greatly impacted and the scheme becomes invalid. The recommended scheme supported by the present study has been applied to the emergency river restoration after this mega-debris flow.